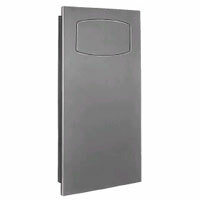 ADA Compliant waste receptacles are fundamental to maintaining a sanitary and pleasant bathroom. Organizations ranging from hotels, restaurants, municipal buildings, schools, commercial offices, factories, theaters, and shopping malls can choose from a wide range of sizes and designs. These options make it possible to accommodate the unique particulars of any restroom design. 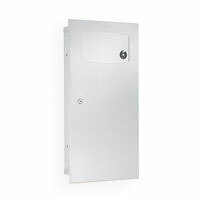 Even homeowners can find something from private residential use in XPB Lockers online store. Our selection is intended to allow any private, non-profit, government, or commercial entity to find a waste container to fit exactly what they need. We know that many restrooms have very little free space and require waste containers that are either smaller in size or that mount in non obstructive positions. We also have special designs available that will compliment the cosmetics of restroom interior design and trap offensive odor inside the waste container. This is why you will find many trash receptacles in our inventory that come with lids or doors that prevent odor from escaping the container. These containers can also be lined with plastic bags that can be removed and disposed of at the end of the day. 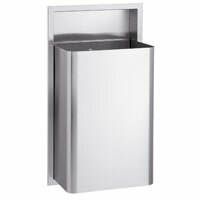 Bradley waste receptacles are made from commercial grade heavy duty stainless steel for several reasons. To begin with, this type of metal has the greatest structural integrity and offers an organization the best assurance against damage by vandalism. Another advantage of stainless steel is its resistance to rust and staining. It will last for decades without corroding in any way. This saves organizations a great deal of money on equipment replacements, particularly in coastal and heavily industrialized areas where salt air and pollution destroy less resilient materials. Most importantly, stainless steel is one of the cleanest surface areas on the face of the earth. It is a completely nonporous substance, so there is no place for bacteria to embed themselves and grow. Cleaning is easy and can be done with any standard disinfectant. You will not hurt the metal, and you can wipe it down in minutes to restore its appearance and fresh smell. Various lid options for waste receptacles contribute to both a more sanitary look and a better smell to the restroom over all. Lids hide refuse and trap odors inside the container. We have several different types of lids that you can choose. The most popular lid type we sell is the swing top lid because it automatically repositions itself after trash is deposited. It is also very effective at blocking smells. Other lid options include dome lids and push lids. 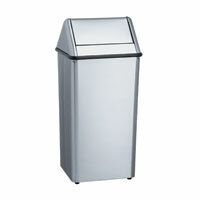 Bradley trash containers are designed to be attractive and convenient as well. The satin finish of stainless steel gives it a clean, contemporary look. Because it is neither ostentatious nor plain, it will nicely compliment into any interior design theme. Bradley waste receptacles are also manufactured in a number of mounting options to make them convenient for architects to include in their building plans. There are free standing units for large restrooms that need the convenience of occasionally moving the container from one location to another. There are also circular, under the sink units that save space by putting the receptacle right where people dry their hands with paper towels. Still others mount to the wall in very small restrooms that need as much standing room as possible left free. These ADA compliant waste receptacles are either recessed, semi-recessed, or surface mounted, depending on what the organization and architect deem most appropriate to space requirement and usage demands. XPB Lockers carries a wide variety of Commercial Outdoor Furnishings, Commercial Lavatories & Bathroom Equipment, Commercial Signage, Bleachers, andLockers installed nationwide. If you can not find what you are looking for call us toll free at 1-877-483-9270 and we will find it for you. Our home office is located in New Braunfels, Texas with warehouses located throughout the United States that enable us to service all 50 states including Memphis, Tennessee, Charlotte, N.C, Milwaukee, Wisconsin, Seattle, Washington, Boston, Massachusetts, Denver, Colorado, Louisville-Jefferson County, Kentucky. Baltimore, Maryland, Houston, TX, Irving, Texas, Amarillo, TX, Brownsville, Texas, Grand Prairie, TX, Pasadena, Texas, Fort Worth, Texas., El Paso, Texas.